Before starting our Step by Step troubleshooter below, it is essential to check to see if you have the latest updates for your operating system and/or web browser. This particularly important with regard to Service Packs. Security updates should not effect you with regard to BridgeClubLive. Downloads may take some time but many problems are solved by doing this. PC/Windows Users please click HERE. LINUX and Mac users should check with their own system providers for updates. Also you may want to ensure you have a good connection to the Internet. As more people are converting to Broadband, this is becoming less of a problem. However, with "dial-up", if you find that you regularly get poor connections, please ask your telephone provider to increase the "gain" on your telephone line. Don't worry, they will know what you mean. Q: Have you signed up for membership? Do you connect to the Internet using AOL? Q:	a welcome screen (similar to the one below) with your name on? Q: Do you see the flashing button shown below? Some people encounter problems when using the AOL proprietary browser. Please try the following steps and then try again. 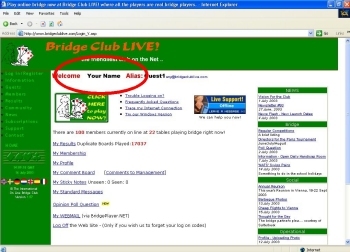 In Internet Explorer, type www.bridgeclublive.com in the address box and press enter. The club site will load but you will probably need to login - so make sure you have your ID and doorkey handy. Click on the Play Bridge Now flashing image and proceed from there. The first time you enter it may take a little longer to load. If you still encounter a problem please advise us immediately. Q: Does a new window ( the "On Line Control Window") open after you click on the flashing "Play Bridge Now" button? Q: Does the yellow loading indicator have an apparently full green stripe? Q: Does it say "Loaded" underneath the green line? Q: Can you see the grey "Play Online Bridge" button? Please click HERE to login with your membership number and doorkey. If you have mislaid the information regarding logging in please click HERE to have the details emailed to you. Please use the email address you originally used to register. Q: Can you now see a Welcome screen with your name? Please click on the button in the Control Window. Does a new window open similar to below? Do you see 9 buttons on top, of which 6 are green and 3 are greyed out? A: You will need to register as a Guest member first, please click HERE - its FREE to register! You may you need to adjust the settings for cookies in your browser. Check the setting of the cookies in your browser. Please click on your own browser for details. It will also help your browsing speed if the amount of disk space allowed for files is set as high as possible. Click on OK and then OK again. cookie should be set to medium. Please start this Troubleshooter again by clicking HERE once you have carried out this step. A: Your browser settings may need changing to enable Java. Please click on the browser you are using. You may have to restart Internet Explorer. It is possible that your display options need adjustment. Internet Explorer 6: Click on Tools/Internet Option/Advanced. Scroll down to the Multimedia Section and ensure that "Show Pictures" and "Play animations in web pages" are both ticked. Internet Explorer 4/5: Click on Edit/Internet Option/Advanced. Scroll down to the Multimedia Section and ensure that "Show Pictures" and "Play animations in web pages" are both ticked. Netscape 4: Click on Edit/Preferences. Under the Advanced section please ensure that "Automatically Load Images" is ticked. Netscape 7: Click on Edit/Preferences. Under the "Privacy and Security/Images" section, please ensure that "Accept all images" is ticked. This may be a faulty cache problem,. NETSCAPE 4 - Edit/Preferences/Advanced/Cache. Click on both clear Memory Cache and Clear Disk Cache. As your machine now appears to be correctly configured, please carry out the following steps. 1: Clear your browser cache.